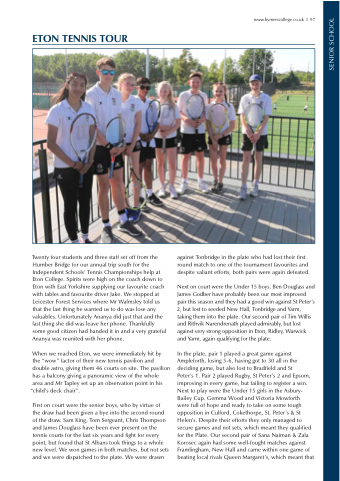 Twenty four students and three staff set off from the Humber Bridge for our annual trip south for the Independent Schools’ Tennis Championships help at Eton College. Spirits were high on the coach down to Eton with East Yorkshire supplying our favourite coach with tables and favourite driver Jake. We stopped at Leicester Forest Services where Mr Walmsley told us that the last thing he wanted us to do was lose any valuables. Unfortunately Ananya did just that and the last thing she did was leave her phone. Thankfully some good citizen had handed it in and a very grateful Ananya was reunited with her phone. against Tonbridge in the plate who had lost their first round match to one of the tournament favourites and despite valiant efforts, both pairs were again defeated. Next on court were the Under 15 boys. Ben Douglass and James Godber have probably been our most improved pair this season and they had a good win against St Peter’s 2, but lost to seeded New Hall, Tonbridge and Yarm, taking them into the plate. Our second pair of Tim Willis and Rithvik Narendrenath played admirably, but lost against very strong opposition in Eton, Ridley, Warwick and Yarm, again qualifying for the plate.